Our most economical pair of doors, but we do not skimp on anything with our Clwyd side hinged garage doors! Made to the same high standards as the rest of our garage door range, the only difference being with the Clwyd is they do not have a solid, full thickness bottom rail. Got an uneven sloping driveway? You can trim the bottom of our Clwyd doors to suit! 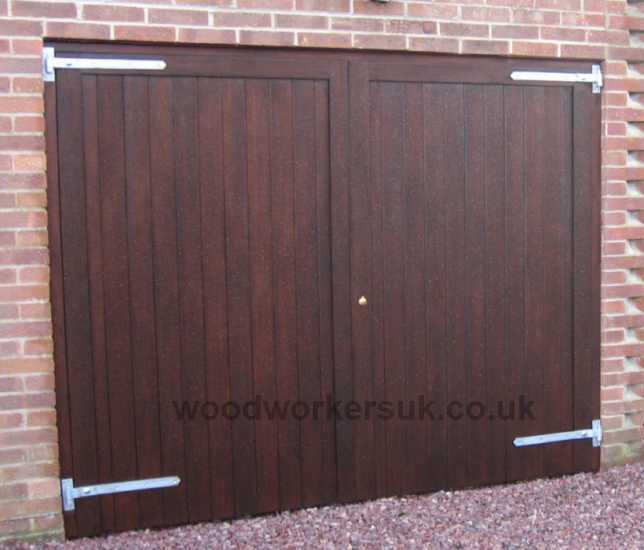 The Clwyd garage doors are manufactured using a traditional through wedged morticed and tenon jointed frame and featuring rebated centre meeting stiles. The tongue and groove cladding is jointed into the head/top rail of the doors and fixed onto the middle and bottom rails (middle rails and bottom rails being visible from the rear only). The Clwyd doors are available in a choice of four hardwoods (including Prime European Oak) and two softwoods (including Accoya). 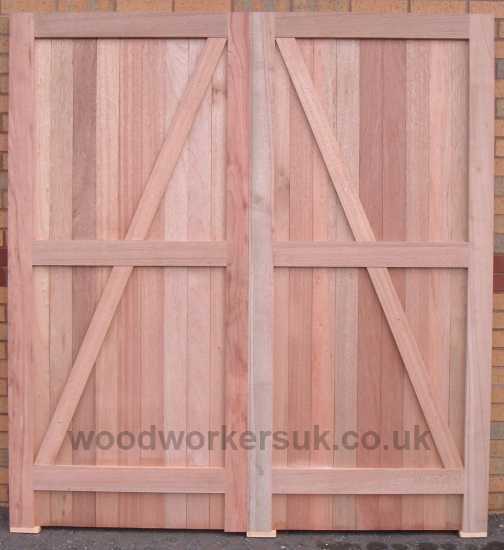 The Clwyd doors can be manufactured as an unequally split pair, but are not available as a bi-folding pair. No solid, full thickness bottom rails? The boarding within our Clwyd garage doors goes right the way down to the bottom of the doors, so these doors can be great if you’ve got an uneven sloping driveway and need to trim a bit off one of the doors – you can trim off around 4 inches / 100mm without affecting the integrity of the mortice and tenon joints on the bottom rail. Looking for a fully boarded garage door with a full thickness bottom rail – why not try our Alyn framed ledged and braced garage doors or if you dare why not have a look at our Menai timber garage doors with three full thickness solid rails? Hidden rails (visible from rear only) – 3 3/4″ x 7/8″ / 95mm x 22mmRebated meeting stiles (the doors overlap when closed). The Clwyd guide prices are based on a pair of doors 6ft 6 high x 6ft 6 overall wide (approx 1980mm high x 1980mm), these are NOT from prices, smaller doors will be more economical etc – contact us for a price! All prices are correct time of insertion and are EX VAT. Free delivery to most parts of the UK mainland is included – exclusions do apply, again please contact us. To get a personalised costing on our Clwyd side hinged garage doors please use the form below.